We had this coop made by an out-of-work cabinet maker. Fortunately, he had chickens too and knew something of their needs. 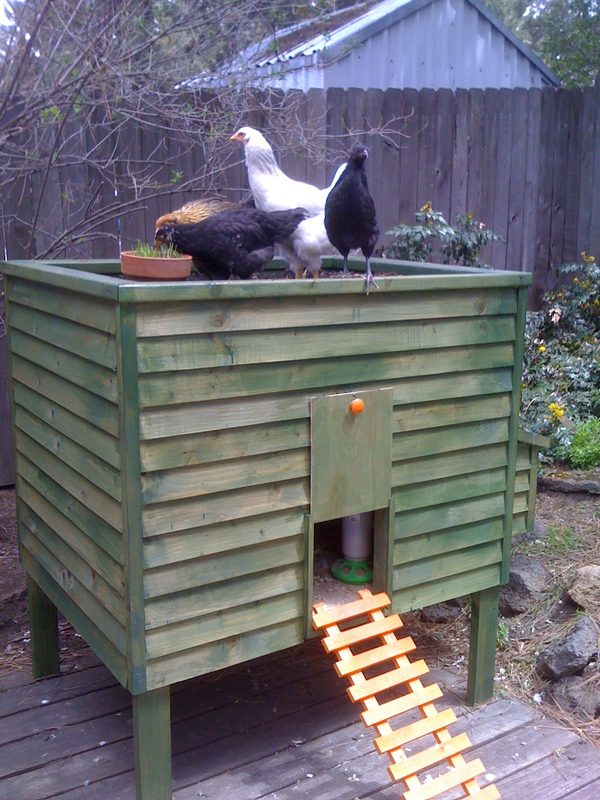 The “custom” part of the coop is the living roof, which we planted with a seed mix called chicken salad! 1. 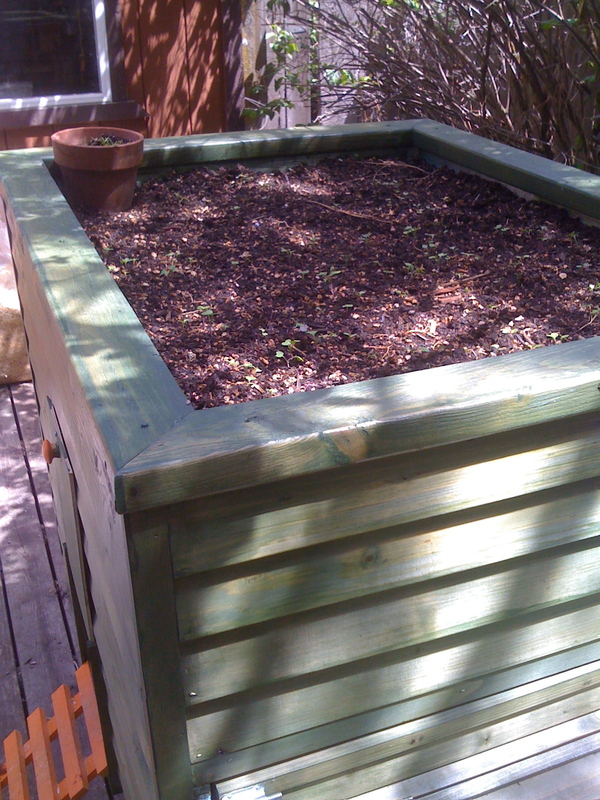 The interior roof is too low as a result of making a planter in the top. I would pay more attention to the inside dimensions. 2. As soon as they could fly, the chickens got on top of the coop and ate the seedlings out of the planter, decimating the first crop. We had to fashion a fence to keep them out until the plants were big enough to tolerate the feeding. 3. The chicken access door slides up and down in channels on either side. In wet or warm weather, the wood expands and makes the door very difficult to open. This has resulted in the handle recently falling off from the stress. I would recommend a hinged door. 4. The nest box is part of a swing-out door that gives access to the coop for cleaning. I also have to open it to fill the feeder and change the water. More times than I care to admit, one of the hens has been in the nest box when I swing that door open. It interrupts their laying, making them less likely to lay in the nest box, and more likely to hide eggs in the yard. If I could do it again, I would build the nest box with the opening lid only and put the big door on the other side. 5. 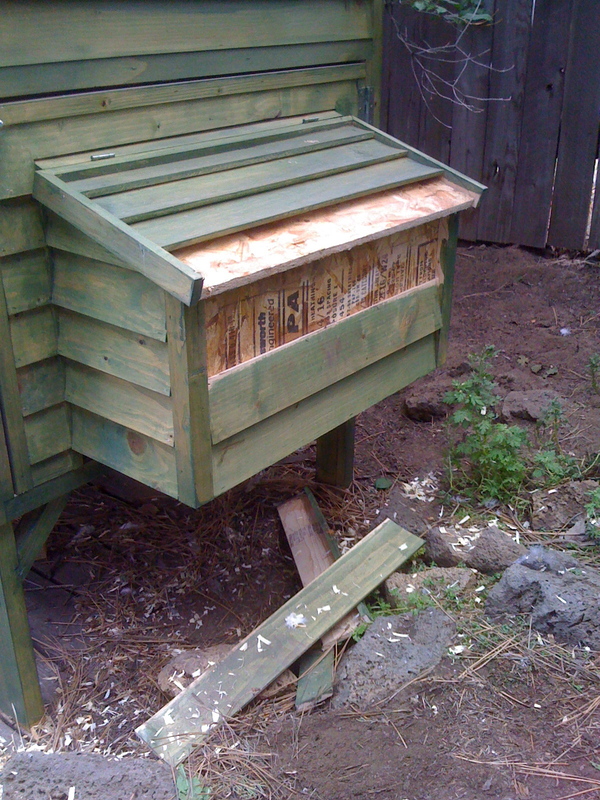 After a visiting dog clawed some of the siding off of the coop (see below) and gained entrance through the nest box, I realized that the coop is not as secure as I would like it to be. If you have any worries about predators, build with solid surfaces, not siding-type wood like we have. Any determined predator WILL be able to get in. 6. 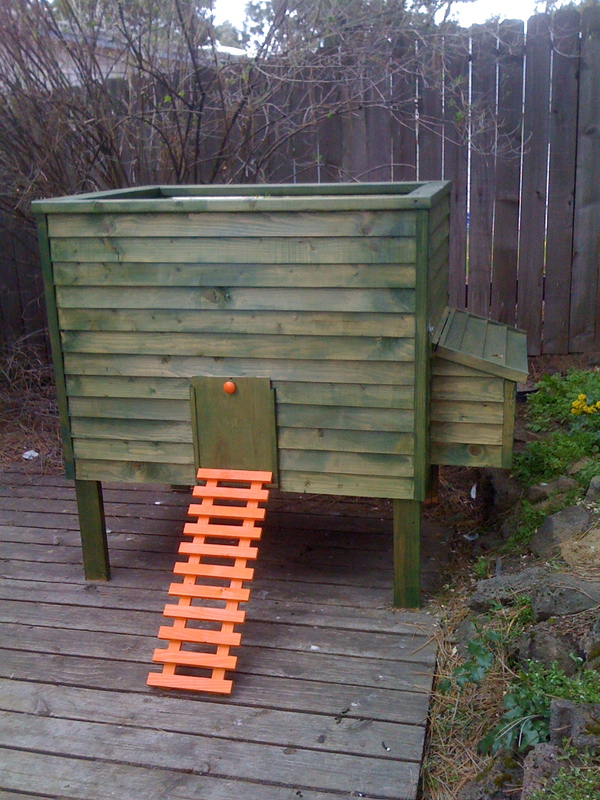 Last, the ramp into the coop should be solid with “steps” for them to grip. What I have amounts to a ladder and it took the girls a while to get used to it. Even now, they usually just fly to the top instead of walking up. Other than these improvements, the girls and I are perfectly happy with our lovely little house! About me: I’m a newly wed who recently moved to a new state. I am a nurse by profession and have found plenty of time for many hobbies. My husband and I became very interested in the local food scene and decided to take some steps toward supplying as much of our own food as we can. Part of that project involved keeping a small flock of laying hens. After much research we decided on cold-hardy heritage breeds, and they seem to be doing very well in our cold climate. We spent much of the spring and summer planting our first garden and growing our own vegetables. Somehow we also acquired some ducks and rabbits, too! Start with a few chickens and watch out, your menagerie will grow!! What a remarkable coop; thanks, Kelli! We know there are other dedicated coop-extraordinaires out there, and we’d love to hear from them. I dont see any vents. What are you doing for ventilation? The door should be an easy fix. There should be discolored areas where it is rubbing, sand these down till it slides freely. Where wood slides on wood, Grandpa would coat both pieces contact points with Johnson past wax. Cute Americauana on the left. What are the other two birds on the right? We don’t remember how much we paid. His name is Mike and he is a great guy. How much did he charge? I WANT ONE!